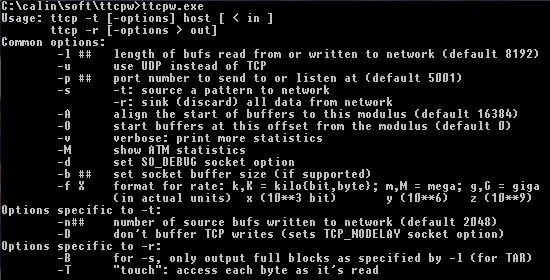 In one my previous posts, I shown you how to test a connection using a hidden Cisco IOS tool called TTCP. A few days ago I run into an issue. 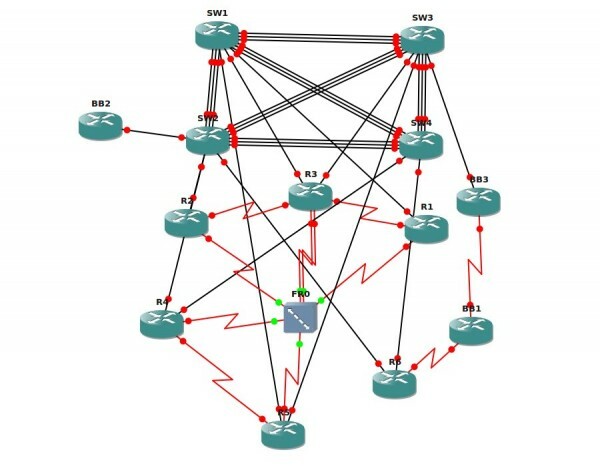 I had to test a TCP connection to a remote Cisco router, but I had not other router on which to initiate the TTCP connection. As explained in Testing TCP Connection post, to use TTCP you need 2 Cisco routers. Now, I found 2 new ways to do the testing without the need of having 2 routers, but just one. Maybe you already know this methods, but for those who don’t please keep on reading. First, there is a Windows tool called TTCPW (download here) (actually you can download also the code, and I think it’s possible to compile and run it under Linux as well). 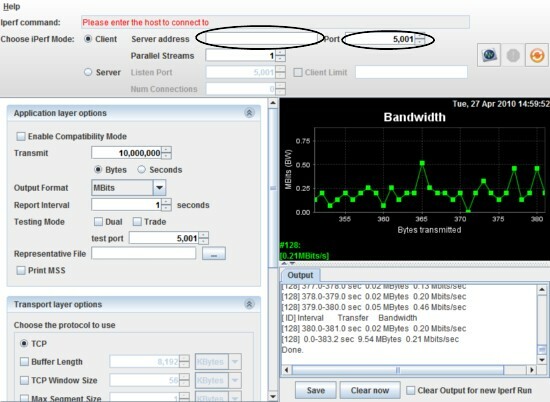 This TTCW tool have the same option like Cisco TTCP and can work together without any issue. On PC side, you download TTCPW and use the same settings. Basically to transmit you only need to input ttcpw.exe -t or -r “ip.address” and that’s it Of course you can tune the settings to meet your needs. Just type ttcpw.exe to see all the settings. Of course there are some limitations on JPerf to TTCP compared to JPerf to JPerf testing. One of then is that you cannot use parallel streams, if you want to stress the connection. To overcome this limitation, I do the following. Open 2 or 3 connection to the Cisco router where TTCP will run. Start one each connection one TTCP daemon with different ports (e.g. assuming 3 connection than ports 5001, 5002 and 5003). Then on the client start 3 JPerf (Iperf) with the same IP address but different ports (you can take the one below). In this way you can stress the connection a little bit. Digging through Internet I’ve found a very good article from David Davis explaining how to make your life easier when migrating from PIX to ASA. The ASA is different hardware and has different interface names. The ASA uses sub-interface commands, like the Cisco IOS. A PIX will use FIXUP commands for application inspection whereas the ASA will use policy maps. On the PIX,outbound and conduit commands are used versus access lists on the ASA. There are two ways to perform this conversion — manually or by using the automatic migration tool. 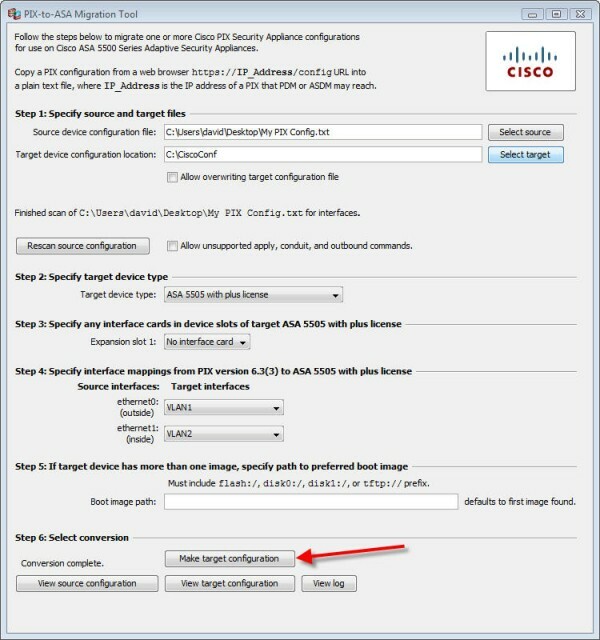 You may want to perform the conversion manually if you want more granular control, but Cisco offers a PIX to ASA Migration Tool that can perform this automatically. Let’s look at how it works.